OPI is rapidly becoming known as the number one brand for introducing us to new formulas, always pushing forward to set a new trend. 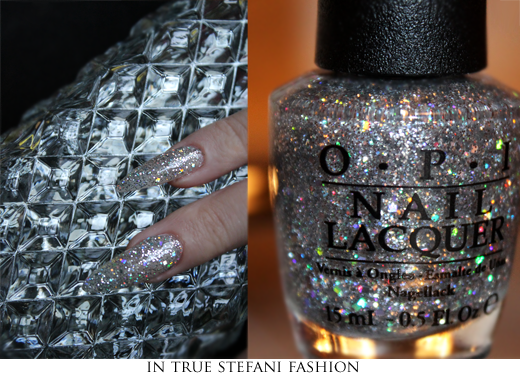 One of their latest hits were the Liquid Sand nail polish which, naturally, many brands have been copying since the launch, and since then OPI have been releasing a couple of Liquid Sand shades with almost every collection. This collections has none but a good variety of formulas nonetheless - and naturally a brand new one! During my early teen years Gwen Stefani was always "that cool chick" - always a bit different from the other artists at that time (well, at least to me), always unique and fun. 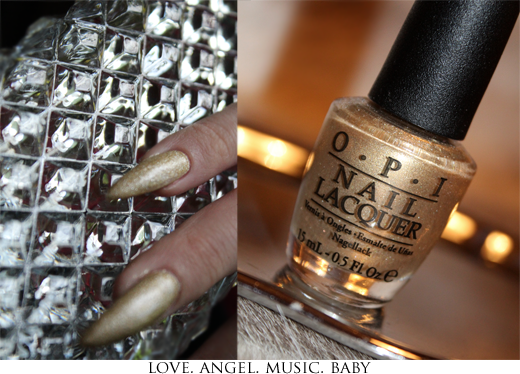 I am therefore quite excited about her teaming up with OPI for a collection of seven limited edition nail lacquers. The signature red and a trace of her pink hair are two of the six shades I have here to show you today. Despite my imprinted memories of the pink haired Gwen singing about how "I kind of always knew I'd end up your ex-girlfriend", most people probably think of red lips and matching nails when they hear her name. 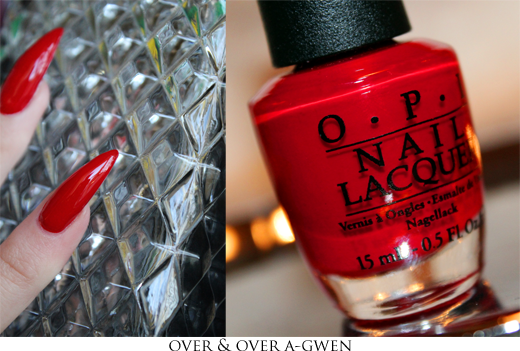 Her signature red OPI polish is called Over & Over A-Gwen and will be available in a special box including black swarowski crystals and different shaped gold, silver and pewter studs along with nail glue to make your own unique nail design. Click here to see a photo of it. The collection includes another two glossy cremes and one is I Sing In Color - a dark chocolate cherry shade. Yeah, you guessed it.. of course the vampy one is my favourite! It doesn't matter how many dupes there might be or how many I already have in my stash - I'll always love a rich burgundy, dark eggplant, dark wine and the like. 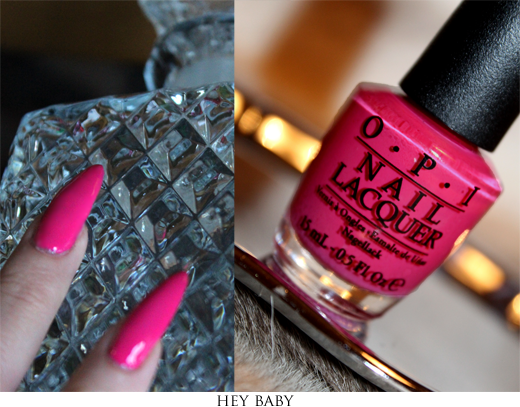 The third creme is called Hey Baby and she's a glossy medium pink. Feel like you've seen it before? 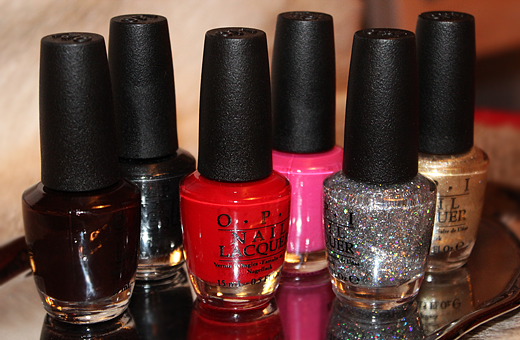 Well, if you already own OPI I'm India Mood For Love or Nicole By OPI Spring Break then it seems you already have a dupe. The collection also features two semi-matte satin finish designed to be worn without topcoat. 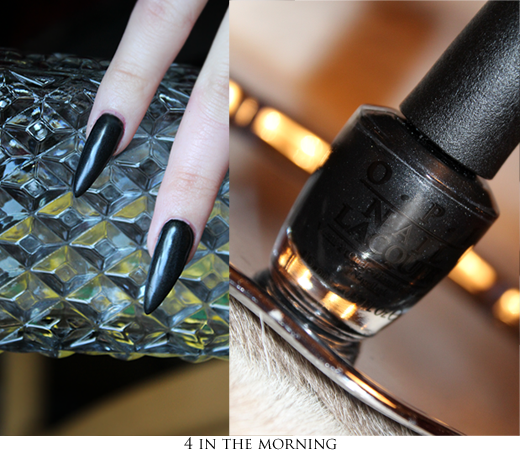 4 in the Morning is a charcoal black that doesn't look so harsh because of the finish. I might actually replace this swatch since it seems it had not dried completely when I took the photo and just noticed it is supposed to look more matte than this - a bit like leather actually. Click here to see more photos of the satin finish. The second satin polish is Love. Angel. Music. Baby - a golden hue that brings my mind to the music video of The Sweet Escape which I currently wish I could live in because of my obsessing with gold for the past couple of months. It's a gold with a silvery shimmer and very, very similar in colour to Honey Ryder from the Bond Girls (Liquid Sand) collection - the finish being the difference. Lastly we have a sparkly top coat and personally I don't see a whole lot of Gwen in this - or rather my version of Gwen - but a glitter is aaalways fun and a holo glitter even better. Try it top of 4 in the morning if that satin finish is not for you. Push And Shove is the name of the seventh lacquer in the collection (which I unfortunately don't have to show you) and also the lacquer that has the NEW formula. I don't know if I can say that it is the star of the collection since I haven't tried it yet, but I would guess it's the most discussed. Push and Shove is a chome hue but requires a special base coat - Lay Down That Base - to get into its full glory. Apparently one thin coat of this + two thin coats of Push And Shove will give a mirrored finish similar to what we have so far only been able to get using MINX nail foil. Judging by swatch photos like this one, this one and this one I feel like the limit of what you can achieve with nailpolish alone has been reached. It makes me think of the silvery 90's fashion and the accessories being sold today inspired by it such as backpacks, shoes etc and that makes the nostalgia-loving, materialistic little part of my heart in a shopping mood. All of the swatches has 2 coats. The collection will be out in stores mid January.